The Nebraska Broadband Map is a great source of information on broadband availability in Nebraska. Here is the map showing broadband availability of at least 25 Mbps down/3Mbps up as of 2016. A quick look at the map shows broadband available in Nebraska’s larger communities and some rural areas. Most rural areas, however, lack access to broadband at 25 Mbps down/3 Mbps up. 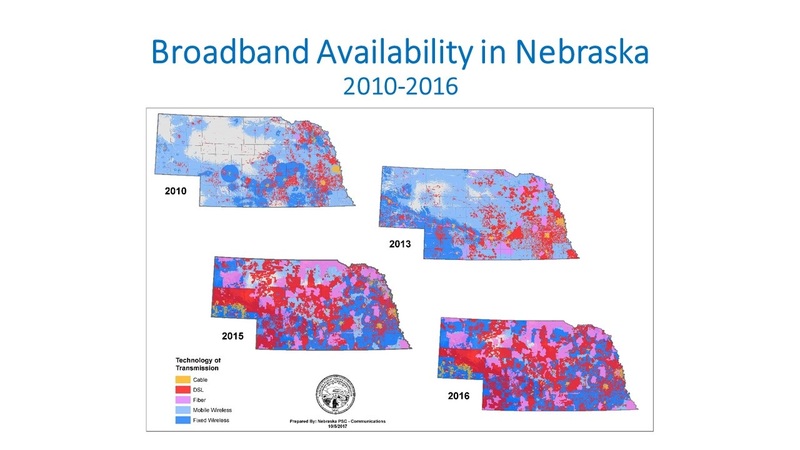 The following composite prepared by the Nebraska Public Service Commission shows how broadband has been deployed since 2010 by technology of transmission. While the coverage of all technologies has increased, the increase in fiber deployment in pink is especially notable given that fiber currently delivers the fastest broadband speeds and is scalable. The increase in mobile broadband availability is also worth noting. Mobile wireless broadband is becoming increasingly important for many users either as a secondary source of broadband in addition to fixed broadband at work, school and/or home or as the primary source of broadband. 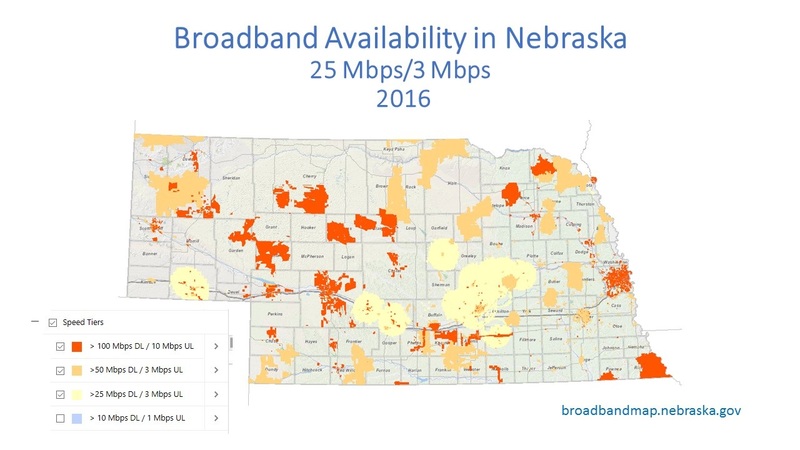 To see maps of broadband availability in Nebraska, go to broadbandmap.nebraska.gov and click on the Layers icon in the bottom left corner. You can then select if you would like the map to display CAF II eligible areas, types of technology, or speed tiers. The map is currently using 2016 data. This blog is part of a series looking at broadband in Nebraska.